Joshua Hays is a Research Fellow for Baylor University’s Institute for Studies of Religion, where he investigates seminary education programs within maximum-security prisons in Louisiana and Texas. He also serves as co-editor of the annual Proceedings of the Christianity in the Academy Conference and works as a freelance editor. Joshua earned a bachelor’s degree in Christian ethics from Union University in Jackson, Tennessee, and the M.Div. from Samford University in Birmingham, Alabama. He has also served in a variety of ministry roles within churches and parachurch organizations in Tennessee, Alabama, and Texas. Joshua resides in Waco, Texas, with his wife Rebecca, who is currently completing her Ph.D. in Hebrew Bible/Old Testament at Baylor. 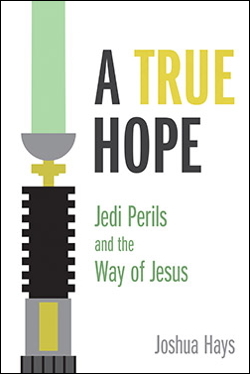 What were you hoping to achieve with your new book A True Hope: Jedi Perils and the Way of Jesus? I want to introduce people who share my love of Star Wars to the good news of Jesus. Over the course of the book, I try to tell the story of Scripture by using familiar characters and scenes from the movies. My hope is that people who wouldn’t normally read a theology book or even attend a church service will pick up this book because of Star Wars and end up meeting Jesus. I also hope that it will help other Christians to communicate their faith to their friends and neighbors.